The large, high-density ball and shape of the Pc-Trac case act as a natural hand rest that mirrors the contour of the hand. 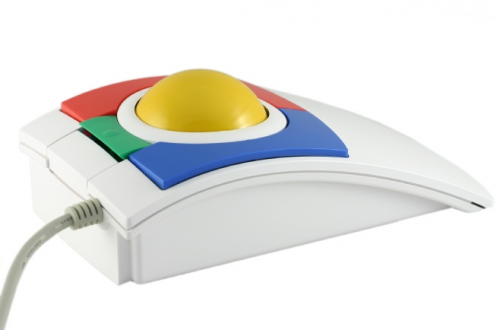 Combined with the special "Ambidextrous" feature, the Pc-Trac trackball accommodates both right and left-handed users and hands of all sizes. No need to move your arm or rotate your wrist from side to side. You will enjoy this desktop trackball's ability to dynamically accelerate across the screen as you turn the ball faster! These easy to use, large trackballs are well suited for those with disabilities and physical handicaps. CST also offers "switch adapted" trackball models that allow the use of external switches for persons with motor control disabilities. Windows 8, Windows 7, Windows Vista, Windows XP, Windows 2000, Windows 98SE and ME, most versions of Linux, MAC OS9 and later and any other USB 2.0 Full Speed compatible operating system such as Sun Solaristm.